It really is a balancing act – to maintain the correct levels in the pool water. If pH or Alkalinity is too low, or Calcium Hardness levels are too high, there can be problems. Other pool chemicals also must be balanced and in a certain “safe area” – an ideal range for each component of water balance that is tested. Pool water quality is affected by the level of pH, which is affected by Alkalinity. Pool water pH levels that are too high can cloud the water or create scaly deposits, but low pH levels allow for pool equipment and surfaces to become etched and corroded. Adding too much chlorine can cause skin and eye irritation. On the other hand, when levels of sanitizers are too low in a pool, they will not provide the power to kill algae, bacteria or other contaminants. Water Balancing chemicals are important because they prevent damage to the pool, or poor sanitation from chemical levels that are too high or too low. Water balance for pools essentially means to bring into balance, the most important being the pool pH, Total Alkalinity and Calcium Hardness levels. 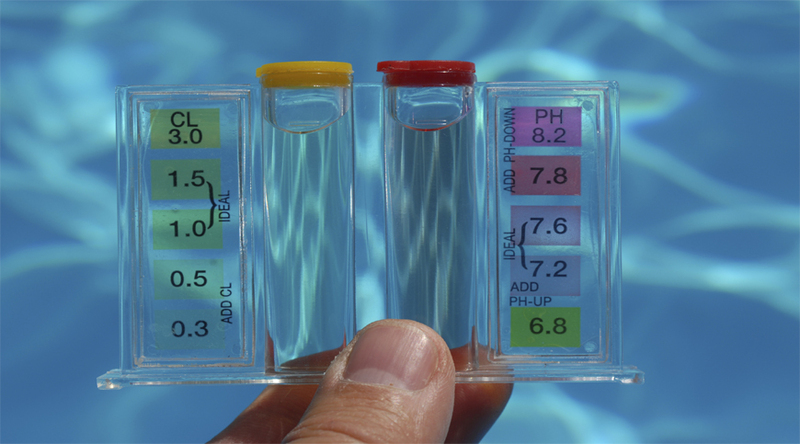 POOL-WATER-BALANCE-PHpH measures the acidity or basicity of the water. The pH scale goes from 0 to 14, and 7 is considered neutral. Anything under 7 is acidic, while anything above 7 is considered basic. Pool pH of around 7.4 is best. Pool water pH values below 7.0 creates a corrosive environment, or an acidic condition. Add a base to bring the pH up, into a more basic range to prevent corrosion. pH levels in the pool water have ideal range of 7.4 to 7.6, and whether higher or lower, it’s not good for the pool or swimmers. At levels above 7.8 only 50% of your chlorine will be active. Pool pH that is above 7.8 creates a scaling or basic condition. This means that scaly deposits may form, or cloudy water problems. High pH also reduces chlorine potency. Add an acid to bring down the pH to prevent the formation and build-up of scale. pool-water-balance-taTotal Alkalinity measures the hydroxides, carbonates and alkaline substances in the pool water. A close cousin of pH, Alkalinity buffers your pH, keeping it more stable. When TA is too low, pH levels are erratic, and not stable. Raise low alkalinity by adding a base to the pool, specifically products labeled Alkalinity Increaser. TA levels should be 80-120 ppm. Total Alkalinity strongly influences your pH level, so if your pH is off, be sure to check the alkalinity. Lowering Total Alkalinity by adding an acid to the pool water. This is harder than it sounds, because it also lowers pH levels when you add acid. Certain types of acid will lower Alkalinity more than pH, but it can still be a process of lowering TA, raising pH, lowering TA, raising pH… POOL-WATER-BALANCE-CHCalcium Hardness measures the softness or hardness of the water. Hard water has higher calcium or magnesium content. These particles can deposit themselves on pool surfaces, lights and ladders, or can frequently come out of solution making the water cloudy. Calcium Hardness is another important factor to any pool. Water can get murky and scale formations can occur as well as stains. It is important to keep calcium hardness levels below 400 ppm, but the most desirable range is usually 180-220 ppm. When calcium hardness is too low, add Calcium Increaser. The water is then too soft and can corrode surfaces in the pool. If levels are too high, scale deposits and cloudy water can become a problem. What’s Temperature got to do with It? The Langelier Saturation Index can be calculated by testing water for pH, total alkalinity, calcium hardness, cyanuric acid and, temperature. When water warms, from 70° into the high 80’s – this changes the way water balance components interact. Generally speaking, higher water temperatures makes your water more active, and is balanced at lower levels for TA, CH and pH. When water temperatures are cooler, higher levels are recommended. The Saturation Index uses a temperature factor to tell you the ideal levels for TA, CH, Cya and pH. The math is a bit complicated, and involves charts, but Pentair has an easy to use online Saturation Index Calculator. Other Pool Chemical Levels Full analysis would include testing for Total Chlorine and Free Chlorine levels, and for Cyanuric Acid levels in the pool. POOL-WATER-BALANCE-CLFree Chlorine is the amount of chlorine that is available to work with, not including Combined Chlorine, or chloramines. When you test your water with a DPD test kit, you can test for Free Chlorine (FC) and Total Chlorine (TC). Subtract FC from TC, and you get CC, or combined chlorine. When CC is over 0.3 ppm, it’s time to shock the pool to remove these contaminants. Free chlorine levels should be at least 1.0 ppm. 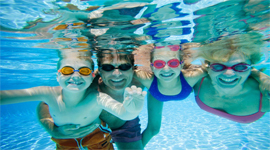 POOL-WATER-BALANCE-CYACyanuric Acid retains the chlorine in the water for a longer period of time. 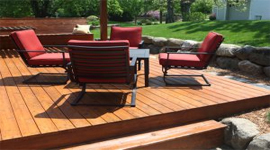 Stabilizer is added to some chlorine to protect from breaking down – which occurs from UV rays. When the pool stabilizer levels are low, your chlorine won’t last as long. The ideal range is 30-50 ppm, and better on the low end as new research suggests that high levels of Cya can suppress chlorine activity and potency. POOL-WATER-BALANCE-TDSTotal Dissolved Solids is another important factor to pool water balance, although it is not often tested unless pool water conditions have become unmanageable. When water evaporates, minerals are left behind – and as evaporation continues, the water becomes more saturated, which makes it harder for chemicals to be successful in their endeavors. This in turn gives pool stains an opportunity to come out and appear in the pool. The only way to lower TDS is to drain some water out and add fresh water. Recommended levels for TDS are less than 2000 ppm, or 5000 ppm for pools using salt chlorinators. BONUS POOL WATER BALANCE TIPS! Test 2-3x per week, adding adjustment chemicals as needed. Run the pump after adding chemicals, to help distribute. Add one chemical at a time, or add them into different areas. Test and adjust in order. First alkalinity, then pH, then calcium. Use the Saturation Index to consider water Temperature. taylor-dpd-cl-brPool chemical levels can be crucial to the health of swimmers, as well as the health of the pool. Unsanitary water, stains and corrosion are common in pools with consistently unbalanced pool water. To avoid these problems, test and balance your pool water regularly, and enjoy your pool with less mess, and less stress! To maintain proper chemical levels, the addition of necessary chemicals is eminent. Contact the professionals at The Pool Store Valdosta or Thomasville as we can provide weekly pool maintenance and guarantee the proper handling and addition of any required chemicals. Special care must be taken when dealing with pool chemicals. Exposure to skin or eyes can cause lasting side effects, as can inhaling fumes. Maintaining proper chemical levels can affect the sanitation of your pool as well as protect the health and safety of yourself and others swimming in your pool. The balance of chemicals in your pool also affects the longevity of your pool equipment and the surface of the pool itself.